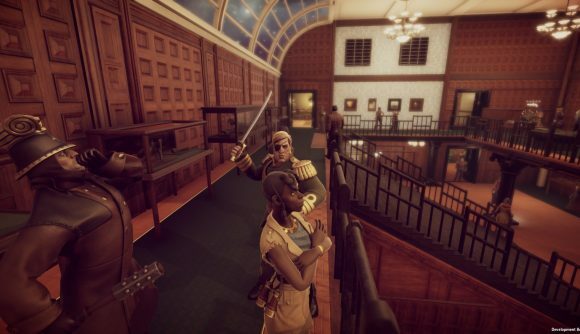 Stealthy multiplayer murder ‘em up Murderous Pursuits is free this weekend, and it’s yours to keep if you install it by tomorrow. Murderous Pursuits is Blazing Griffin’s follow-up to the similarly themed murder mystery cruise The Ship – it’s a game for 1-8 players in which you try to remain as unobtrusive as possible while stalking another player who you’re supposed to sneakily kill. The catch, as you might imagine, is that other players are trying to hunt and kill you, too. Once again, the game is set aboard a Victorian-era cruise ship, and it’s full of wacky characters and even wackier costumes. Using a combination of disguises, tactics, and the ability to blend in with the crowd, you have to try to remain alive long enough to give your target the old Agent 47 treatment. It’s a solid game, but as PC Gamer points out, it’s struggled with player numbers since it launched in April. Blazing Griffin is probably hoping to goose that figure by offering the game for free this weekend, and it seems to be working: last month, the game peaked at 20 concurrent players, while its most recent 30-day peak is up to almost 150,000. If you want to give it a spin, head over to the Murderous Pursuits Steam page and click “Install Game.” You have until Monday, October 29 at 10:00 a.m. PDT to snag it free. My backlog is already ridiculous, but I think I’m going to check it out – hanging out next to walls and not being noticed is a skill I honed to a fine point in high school.